Let's put all the cobalt and black things together! Even with colder weather here to stay, I still wanted to find a way to wear my new shoes. At first I was a little unsure of how to style them, but pairing them with a bright color seemed to be the right choice. The rest of this outfit came together really easily with a blazer from Le Tote and oversized scarf for warmth. Patterned shoes are the perfect option for pattern mixing on a smaller level. Do you prefer plain or patterned shoes? 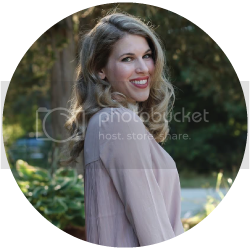 Today's giveaway is for some amazing items from Pink Blush Boutique. 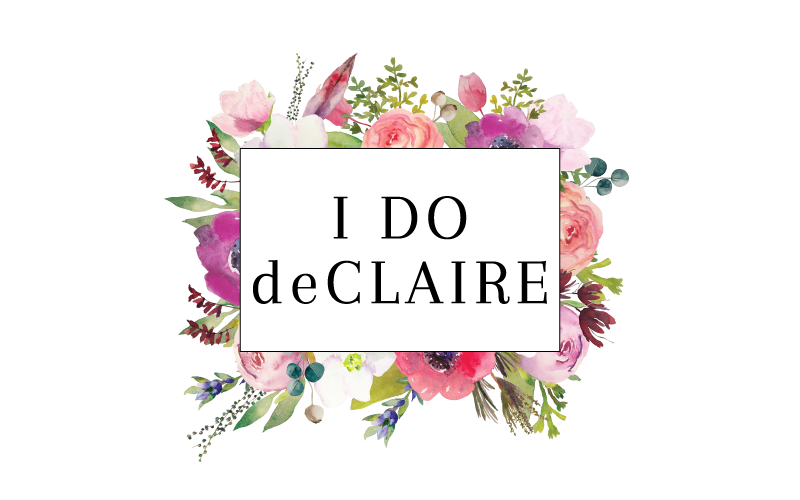 They seriously have such cute items maternity and nonmaternity! You can enter at Love Me, Dani Marie! 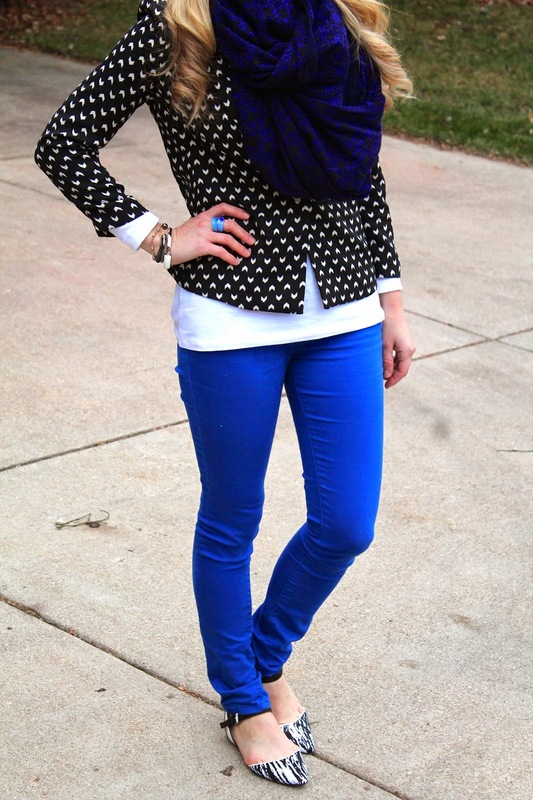 Love everything about this outfit, the cobalt blue is so fun!! Cobalt and black is such a pretty combo! Those flats are super cute! Glad you got to wear them before we are bombarded with snow! Love this outfit! I love the blue and black combo! What a fun blazer and shoes. I think skinny jeans were made for your legs! Love this color combo! Great pattern mixing too between the scarf, blazer and shoes...love it!! 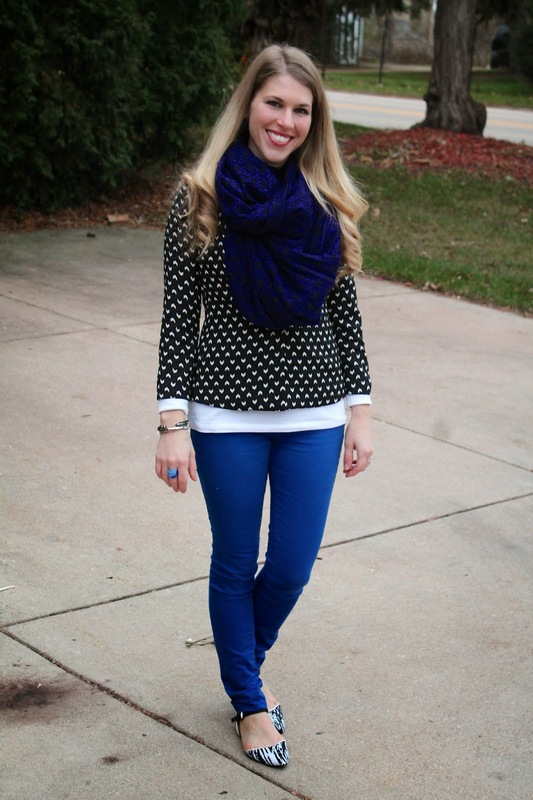 Love the cobalt blue, super cute look! 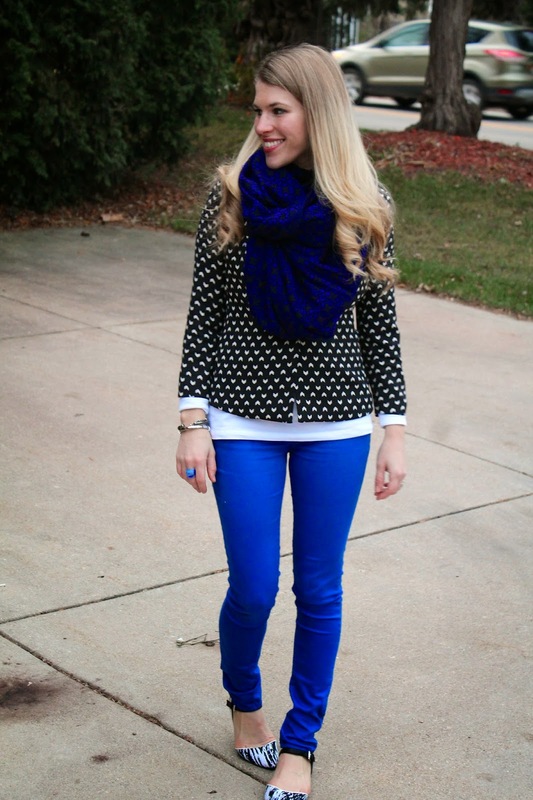 Cute outfit love the blue pants and all the layering! Saw you on the Pleated Poppy. 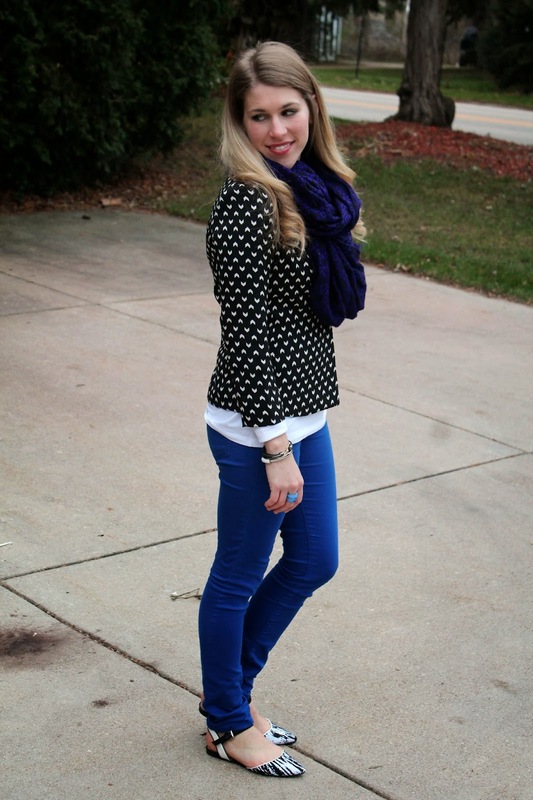 Adorbale polka dots with the blue pants, love it, looks great on you. I have been wearing lots of black and blue lately. love everything you are wearing especially the blazer and shoes. I love this color combo, definitely a winner! That's a stunning scarf and your new shoes are quite unusual. Love the blue jeans too.You look great. i can kinda recreate this in my closet. 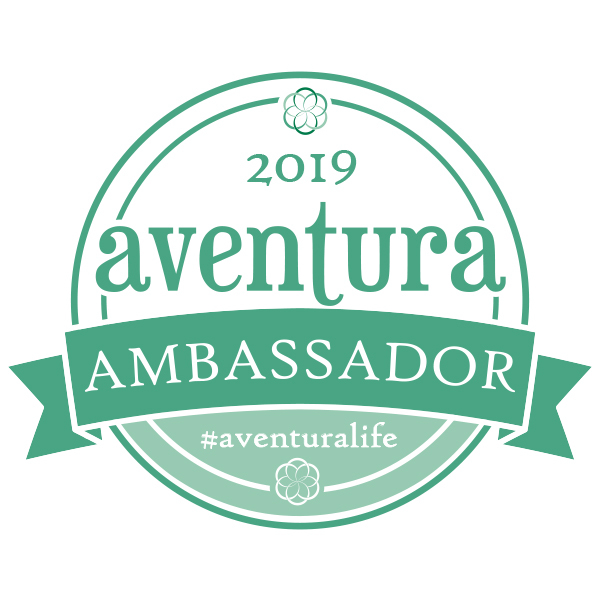 so excited for this winning combo!! Seriously, cobalt and black (and white!) are the perfect combination! I really love those shoes too. I don't have any patterned shoes other than some leopard print ones, but I've been thinking that a pair of striped or polka dotted shoes might be fun! The blue is beautiful, a lovely scarf is on my want list. Love the cobalt paired with the black and white! Sharp look! oooo I like your shoes! You really can't go wrong with cobalt black and white together. And that Nordstrom Rack scarf you linked to is sooo tempting! I love printed shoes in theory, but in reality they can be a huge styling challenge! I do love these paired with the cobalt!